Because we are a small organization, are programs are a very cost-effective way to impact the lives of many people in the community. Donations of all sizes are welcome! 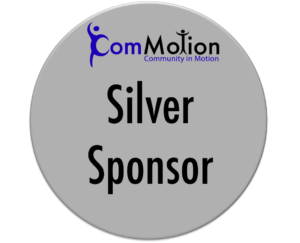 ComMotion is a sponsored project of Fractured Atlas, a non‐profit arts service organization. Contributions for the charitable purposes of ComMotion must be made payable to “Fractured Atlas” and are tax‐deductible to the extent permitted by law. Federal Tax ID available upon request. 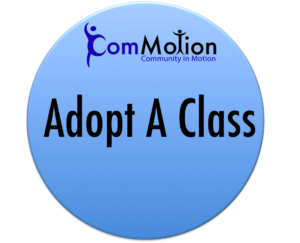 For a donation of $80, you can adopt a class in the program of your choice. You will be recognized as the sponsor of that class session in social media, and we will send you photos of your class. A $200 donation will support multiple classes, enabling the participants to see their progress from week to week. 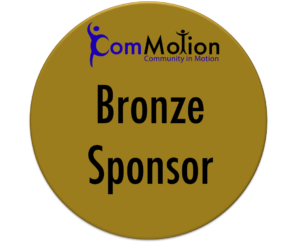 As a Bronze Sponsor, you will be recognized on our website, social media, and in promotional materials, with your name and company/organization logo (if applicable). A $500 donation will support a multi-week class series or provide a session of programming for rural and underserved communities. As a Silver sponsor you you may provide a banner or sign to display at our classes and events, in addition to receiving all of the recognition of Bronze-level sponsorship. A donation of $1,000 or greater enables ComMotion to provide long-term programming across multiple locations, truly making a lasting impact in the community. As a Gold sponsor, in addition to Silver Sponsor-level recognition, we will provide a dance lesson or team building event for your group or organization, so you can share in the dancing that you are providing to the community.